Cylinders: 2.0L H4 16V GDI DOHC - 4 cyl. 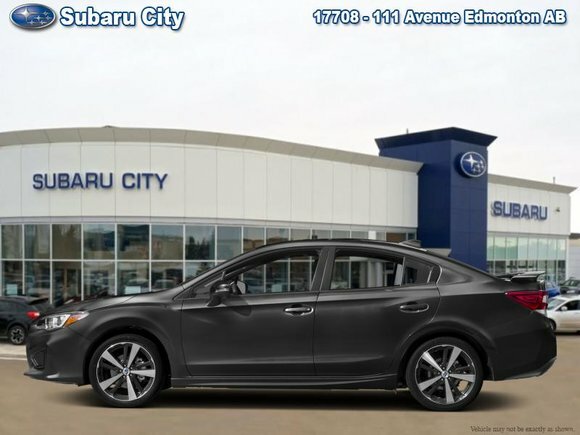 The 2018 Subaru Impreza stands out in a very competitive class. That's thanks to its standard all-wheel drive and distinct attitude. It meets or exceeds its competitors at just about everything. Generous tech, a comfortable cabin, and a reliable drivetrain make the Impreza a desirable package. For something a little different in the compact class, check out this Subaru Impreza. This gray sedan has an automatic transmission and is powered by a 2.0L H4 16V GDI DOHC engine. Motivated by that spritely motor it gets 8.3 L/100 km in the city and uses just 6.4 L/100 km out on the highway according to Transport Canada. Our Impreza's trim level is 4-dr Sport AT. The Sport trim takes the Impreza to the next level. It comes with an 8-inch infotainment system with Bluetooth, SiriusXM, 2 USB ports, six-speaker audio, aluminum wheels, LED turning headlights, a side sill spoiler, a power sunroof, premium cloth seats, a power driver's seat, heated front seats, aluminum pedals, blind-spot detection, lane change assist, a rear view camera, and much more! This vehicle also has the following features: Sunroof, Bluetooth, Heated Seats, Rear View Camera, Siriusxm. Want to try the 2018 Subaru Impreza 4-dr Sport AT?